Help Local Moms on Mother's Day! - Yo! Venice! Home Venice Beach Events Kids Events Help Local Moms on Mother’s Day! Help Local Moms on Mother’s Day! May 12th is Mother’s Day! 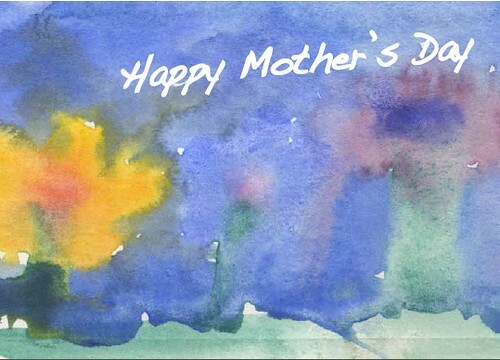 Honor a woman who has touched your life this Mother’s Day with a beautiful card featuring artwork from children in our Study Lounge program! For a $20 donation VCH will send a card to the honoree of your choice! Additional cards are available for $10 each. 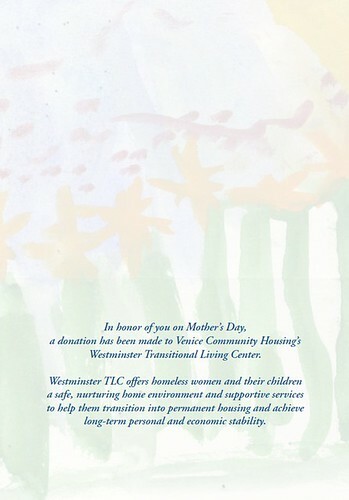 Proceeds from Mother’s Day card sales will benefit our Westminster Transitional Living Center. Homelessness has a devastating effect on families. Homeless families need housing first and foremost as a means of stabilization, but they also face multiple barriers to long-term self sufficiency. Domestic violence, lack of education, unstable work history, and multi-generational poverty are just a few of the barriers women and their children face to achieving long-term personal and economic stability. Since 1993 the Westminster Transitional Living Center (Westminster TLC) has provided a stable, nurturing environment for women and their children to escape homelessness and change the trajectory of their lives. Westminster TLC not only provides a nurturing home environment but also supportive services that help families successfully secure and maintain permanent housing. Over 150 families have called Westminster TLC home since the facility opened. Thank you for your continued support! Happy Mother’s Day!